New photos of Apple's next iPhone appeared on Weibo earlier this week, teasing bloggers with hints of what Apple is going to be launching this Fall. 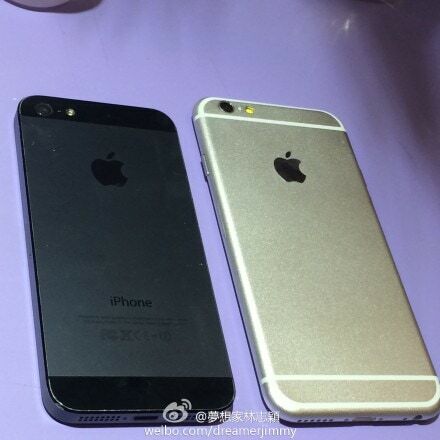 The photos confirm that the new iPhone (6?) will sport a larger screen, most likely 4.7". It has thinner bezels on either side of the screen as well as less space above and below the screen, and it's most notable feature is a curved rear shell which closely resembles the rear of the iPad and not the squared off shell of the iPhone 5s. Aside from detailing on the rear shell that may or may not make it into the production model, there isn't much else to see in the photos. But photos published by Nowhereelse.fr also highlight the thinness of the iPhone 6, which is expected to be significantly thinner than previous models. The 4.7" iPhone 6 is expected to arrive this Fall, possibly sporting a 1704 x 900 resolution display. There have been additional rumors surrounding a larger 5.5" model expected to go on sale at around the same time, likely in shorter supply and with a higher price point, but we haven't seen any leaked hardware. This blogger is not convinced that the larger iPhone will be making an appearance.